Hello, my name is Wendy and I am a lame Bible reader. This might surprise you since I write a blog called, I Love Devotionals. I even contributed six devotionals to The NIV Bible for Women. Yet I find recently that I pick up my phone to check social feeds more than I pick up my Bible. Sound familiar? I haven't read my Bible this year. The Bible I keep next to my bed. In fact the only time I touched it this year was to move it off the bedside table and into the draw. I've googled for verses I remember and read those, shared some of them here even - but I haven't sat down with my Bible just to read it. 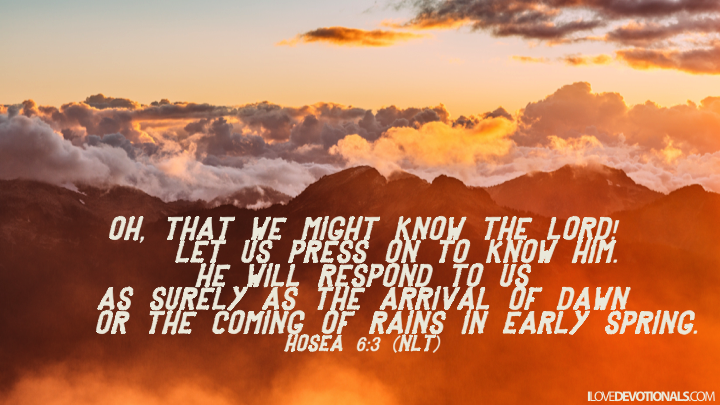 I have found that the Bible helps me to glimpse the Jesus that likes me, that reminds me that God flung the stars in the sky and that he calls me by name, and anchors me with promises when life isn’t going so well. I’m hungry for more of God and I know that one of the ways to feed that hunger is to read the Bible. For the next 30 days I've created a Bible reading challenge for myself. 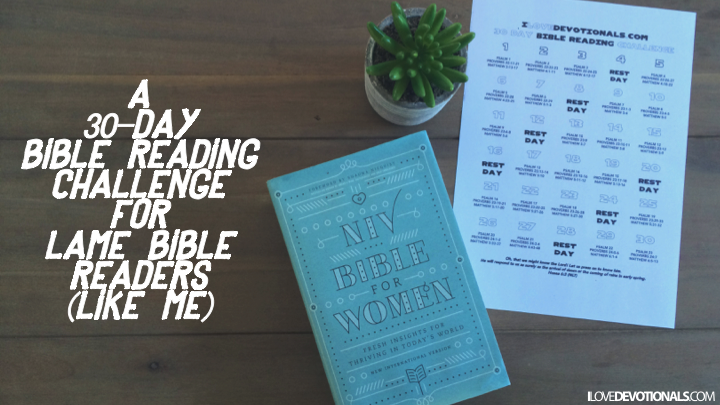 Click here to download the 30-Day Bible Reading Challenge as a printable PDF. I'm not trying to do anything extreme like read the bible through in a month (although I have done that in the past). And I’m not trying to make a chore out of reading the Bible. I decided I wanted each days reading to take me about as long as it would take me to click through and read an article I find on Twitter. The idea is to get me reading the bible again it isn’t to hang something heavy around my neck that I can’t bear. I based my Bible reading challenge loosely on something my Grandfather used to do. He read through the Bible every year. And I can’t remember his plan exactly but it went something like, read one chapter of Proverbs a day, read one psalm, and one chapter in the Old Testament and one in the New. In this way he’d read through the whole Bible in a year, Proverbs monthly and the Psalms at least twice. My goal is much smaller. It is to read one Psalm, one wise saying from Proverbs, and about 5-10 verses in Matthew. I’ve also left a rest day every fourth day. You could skip this or use it to catch up if you’ve missed a day. There are 100's of ways to read the Bible and to connect with God so please don't feel you have to follow what I’m doing. Or that what you're doing now might be wrong. When I told Xylon what my plan and invited him to join me he shook his head and said, "I don't like structure." A few minutes later, Xylon made me laugh when I was finished as he went on to audit my reading, "You can't be finished yet. That was too quick. Are you sure you read a Psalm?" If you haven’t joined our community over on Facebook and you’re keen to read through this 30-day challenge with us please go like my page now. From time to time I’ll posting bible verses from the challenge and would love to hear your thoughts. Or if you just want to keep track of new posts on the blog then subscribe here. If you enjoyed this post please click here to share it on twitter.